There will be interesting news here shortly. Sometimes things seem to take very long but the one thing that is still true is that when real perfectionists do not want to compromise on anything and are still looking for the one and only ultimate result it is still worth the waiting! Peter Gabriel has purchased five Brauner VMA and six Phanthera microphones and uses them currently for his latest project “Scratch My Back”. Peter became aware of Brauner Microphones after his guitarist Richard Evans bought a VMA. They then used VMAs for a National Geographic music score he was doing in Budapest. Five VMA were used there for the main surround system, augmented by sixteen Brauner Phantera for orchestra spot mics and a custom vintage mic pre rack carefully refurbished by Brauner. The Budapest recordings were a great success, and this year when the “Scratch My Back” sessions started Peter had to have those VMAs for the new recordings again augmented by twelve Phantheras as spot mics. Brauner Microphones is once again supporting the Haldern Pop Festival taking place from August 13th to 15th, 2009, in Rees-Haldern, Germany. This small festival is famous for its special, intimate atmosphere and a great selection of artists from newcomers to well-known bands. This year's line-up include The Soundtrack of Our lives, Paolo Nutini, William Fitzsimmons and many more. 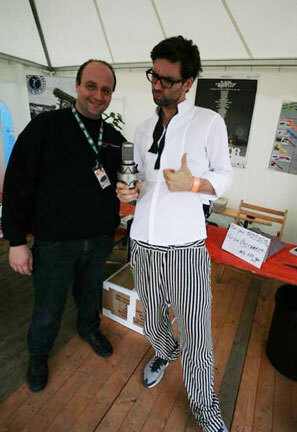 The picture shows Dirk Brauner giving British artist Jamie Lidell his very own VMX microphone on the festival 2008. Brauner Microphones can once again be found on the "musikmesse" fair in Frankfurt, Germany, from April 1st to 4th, 2009. We are looking forward to you visiting us in hall 5.1, booth A48. You will be able to have a close look at our established product line as well as some new releases. Browse our archive for older news.